BentoLunch.net - What's for lunch at our house: Cute Little Froggie Snack! So far today, the kids had two breakfasts, their own cereal & fruit, then bagels & cream cheese while Shaun & I were having our coffee & bagels. They, of course, still wanted lunch, but I had a feeling that a huge lunch wouldn't be eaten. 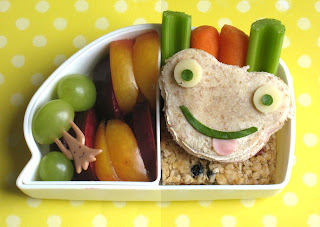 Instead, I borrowed and idea from Pikko @ Yum Yum Bento Box that I had bookmarked & used my bear rice mold to make a frog face! I did make it a sandwich instead of rice. F&B like their rice warm out of the rice cooker. Ben has a triple decker froggie face sandwich--Nature's Own Honey Wheat, turkey, ham & cheese. Lest you think it's huge, I got three froggie face breads out of one slice. The eyes are white cheddar with a bit of baby spinach for the pupils and a baby spinach mouth. The tongue is a tiny bit of extra ham. Underneath the sandwich is a homemade strawberry-blueberry granola bar from my freezer stash and a couple of carrot & celery sticks. The other half features a combo of yellow & purple plums and a few green grapes to keep things in place. It's packed in his Shinkansen shaped box which I love, we haven't used it in a bit and it is so cute. I have a grand son who is not a good eater but I bet he couldn't even resist this one. OMG I love the tree pick! That is the cutest thing ever! Great use of a rice mold for a non rice treat. Took me a while to realize the tree was actually a pick in a grape, it's sooooo adorable! I absolutely adore you for teaching your kids to eat vegetables. My kid sister hates them. She'll always find a way to separate the vegetable from any dishes. Thanks everyone. This one was really fun to make, Ben loved it too.